If there’s any image that boxing brings to mind, it’s the athlete standing at a punching bag, spending hours working on his swing. Both the peanut bag and the heavy bag are useful tools in training and practice; tools that can even be used when one doesn’t have a sparring partner to work with. These bags, especially the heavy bag, aren’t just useful to boxers, but also to those studying any sort of martial arts. The ability to have something that absorbs your blows and reels back like an actual opponent can’t be overstated. Most people just buy their punching bags and stands, as a basic stand and bag setup isn’t really all that expensive. But that’s all they are… basic. You can make yourself a much nicer stand, something that you can be proud of and which will look much better sitting in the corner of your family room, garage or whatever area you use as a gym. There are several ways of going about this; but there are a few basic requirements for any heavy bag. First of all, it has to be fairly heavy. You’re trying to get that bag to simulate a person’s body that you’re striking, so it needs some weight. Secondly, it needs to be resilient or it’s just not going to last. That includes the stand as well, for ultimately the stand has to absorb all of your strikes. Finally, the stand has to be sturdy enough so that it isn’t going to move when you hit the bag. The punching bag itself needs to be fairly heavy and fairly solid, but not solid enough that you would hurt your hands on it. It also needs to be strong enough to handle the abuse of being hit hard repeatedly, without breaking. All the materials used in making it should be chosen with this in mind. A great punching bag for beginners and children can be made out of carpet padding. The advantage of this material is that it is easier on the hands, something important for young ones. To make this sort of bag, start out with a piece of 3” or 4” PVC pipe. Drill holes in one end, to hang it by and attach a disk of plywood to the other end, that’s the diameter that you want the finished bag to be. This disk is important and needs to be attached well, as it is what’s going to keep the carpet pad from sliding off the pipe. Cut a piece of carpet padding (new or used, make sure glue is removed) to match the width of the PVC pipe, less about 1 inch. You need this inch of extra space at the top, for attaching ropes through the holes you just made in the pipe. Tape one end of the carpet pad to the PVC pipe with duct tape (to keep it in place) and start wrapping the carpet pad around the pipe, ensuring that each layer is snug over the previous. If you run out of carpet pad, tape off the end of the piece and add another, taping it in place. Your goal is to get enough pad on the pipe to exactly equal the diameter of the plywood disk that is at the bottom end. When you get there, cut off excess pad and tape in place. To add strength and prevent the carpet pad from becoming damaged, cover the carpet pad with a layer of duct tape; one continuous piece, wrapping it from one end to the other and capping the ends. Overlap each layer over the previous by at least 30 percent, to ensure that it has good adhesion. A more solid punching bag can be made out of a burlap sack (50 lb. potato sack), if you can find one. Line the burlap sack with a large heavy-duty plastic bag, such as a lawn and leaf bag. You’ll want the plastic bag to fully fill the burlap sack, so that the burlap can sit right up against the plastic. The plastic provides a non-permeable layer, to keep the stuffing in, while the burlap provides a surface that can withstand the abuse of being hit regularly. Start by filling the bottom of the bag with sand to provide weight and stability. You’ll want somewhere between 10 and 25 pounds (5-15 kg) of sand. The more sand, the greater the stability of the bag and the less it will swing when you hit it. With the sand in place, start filling the bag with sawdust or wood chips. You can buy this from an animal feed store, as it is used for bedding for livestock. If you want to save money, you can probably get all the sawdust you can use from a local sawmill or cabinet shop. They are always looking for ways to dispose of excess sawdust. You want to pack the sawdust into the bag as tightly as you can. So, once you have it most of the way full, take a wood pole and push it down, packing it in place. Add more sawdust or wood chips as needed, stopping about 8 inches short of the top of the sack. Fold the end of the plastic bag over first, pushing out the air and rolling it up, until you get down to the level of the filler. Then tie the bag off, making it as airtight as possible. Then gather the edge of the burlap sack together and tie it with thin rope. You’ll want to wrap the rope around the neck of the bag several times, making what is known as a “bag knot” or “miller’s knot.” You can use the ends of the rope from your miller’s knot to hang the bag or tie a larger piece of rope to the top of the bag, just below the miller’s knot. Almost the same thing can be done with a canvas duffel bag, as what we just talked about doing with a burlap sack. About the only difference is that you don’t really need the plastic bag inside the duffel, unless it has small holes in it. A military-issue duffel bag or something similar is ideal. It is tough and about the right size. Cut the straps, their buckles and handles off of it, being careful to not damage the bag in the process. Fill it as mentioned above and then close the top. The eyelets in the top can be used for the rope to hang it. There are a number of ways of hanging a punching bag. Some people will hang them directly from the floor joists, when building their gym in the basement. You can also make a good frame out of heavy timber, joining them together to form an overhead crossbar to hang from. But these sorts of stands take up a lot of room; room you may need for other things. It would be nicer to have a stand that can sit in the corner of the room, taking up as little space as possible. We can make such a stand out of plywood. While it would be possible to make this out of heavy timbers as well, it will be both lighter and stronger if we make it out of plywood. Two layers of ¾” plywood, laminated together, make a very strong beam. This also allows us to screw into the ends of the pieces, something that doesn’t work well when merely screwing into end grain. This design also allows us to use very few joints, adding to the strength even more. Typically, the joints on a structure are the weakest points, so we want to minimize those. 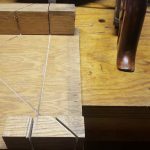 One edge of each gusset will have to be beveled at a 45 degree angle, so that it can sit up flush with the side of the hanger. 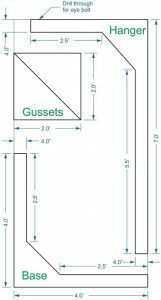 The two gussets need to be different, in that the bevel is at the opposite angle on each of them, making one right-hand and one left-hand gusset. Assemble the punching bag stand by attaching the hanger to the base with two 3 ½” hardened screws, drilling and countersinking them from the underside of the base and into the bottom end of the hanger. Attach the gussets in the same way, to either side of the hanger and running parallel with the legs of the base. Screw through from the bottom of the base into each of these, and then through the gussets into the hanger with 2 ½” hardened screws. An eye bolt is attached to the end of the hanger, proving a means of attaching the bag. The whole thing can be either painted, stained and varnished, or left plain for use.